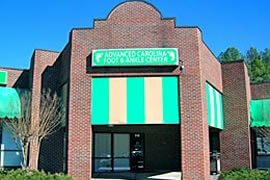 Advanced Carolina Foot and Ankle Center is dedicated to providing the best in foot and ankle care. Our practice has 2 locations to serve the communities of Garner and Kenansville, NC. Our podiatrist, Dr. Chukwuma Ukata, treats a variety of general podiatric conditions including heel pain, ingrown toenails, and bunions. He also specializes in diabetic foot care and orthotics.